What readers could I have, if I believe in what I write. I would be shocked to see them. I wouldn't like it. Don't even dream of it. Don't forget to ran from yourself, my man. Yes, yes, I'm still trying to sort out my websites, directories and pages. Since some of them got their Identities (Sellassie sites, Film-North, Theatre w/Anatoly), I have to get focus of those of my homes which are not defined. "GeoAlaska" is one of them. To represent me-writer and writing projects from many other sites? My WRITE web-directories are turning into a "Writer's Diaries" -- should I call this (new) book "WebWriter"? A companion to my nonfiction? What is the outline? I don't see it. I never right about myself. Whatever I write about the common man as applicable to me. I do not have myself anymore, I became indifferent. Every day is another day, when I do not wait for anything. It's not that "writer's block" they talk so much; I never had it. I don't even read what I wrote before I left for Europe. I remember it, the texts -- what I can find there for myself? What can it tell me about myself or life? You are not looking at me, life. I became invisible. Something I always wanted. It's about love. When it's gone, you are gone. You don't even have to die. I left the film WRITE directory for textbooks mostly. I wanted to escape the flat writing. Away from the functional texts, memo writing style. I knew that the repulsion is coming -- what could I expect from "text" books? No, I must go back to my "instructional" pages and populate them with the stories, images, symbols! I crave for simplicity. All great works are simple. What is the secret? The plot, I guess. The story through the character. "Anna Karenina" -- the story and the character become one. If they do not merge, the message goes through some formalistic devises... Look how much (little) you invested in your characters (The Russian Trilogy); are the "father" and "son" metaphors? "Father" is the story, "son" is the story -- and their separation is the old myth. Fate even. No matter what they do. Oedipus; killing your father (Zeus' birth). So simple, so radical. No need to dwell on the foundations. Anna is a woman. Simple. Everything else to follow. Father and son -- no room for two, only for one male. Even in Christian myth Father sacrifizing his Son... It is so? Does father dies for his son? Is it possible? The the answer -- and you have the great story. To sort out the Russian Pages (in Russian)! ... I am thinking too much, it's not good. I am getting stupid. 8.14.05: lulu.com/theatre * I'm about to get myself into a new trouble -- POD... A lot to learn. "Записные книжки" -- кто их публиковал до смерти? А может быть интернет и есть эта "Общая Тетрадь"? "Русские Страницы" жили тихо до лета 2005 года. Что я не хотел по-русски писать так долго? Гордыня, наверное. 2.19.06. Жизнь моя кончилась ( в который раз ) лет десять назад. "Личная" жизнь. Я потерял интерес к себе после России и Африки. Я продолжал насиловать себя, втискивал "прозу" в три "последнии" книги (от САМ до Теологии Технологии)... Хотя стилистически это правильно, книги эти принадлежали "Книге Зрителя" и "Идельный Театр" (вне меня, без меня, когда я только оставался "предметом" моих наблюдений). Почему я не понимал этого перелома? Даже сейчас, десять лет спустя, тяжело -- а что ты тут делаешь? Что? Пишу, думаю -- и пишу. Писать должен каждый. Лучше хорошо. Немой -- калека. (Father-Russia) На английском. Книга, конечно, не закончена. Теперь появляются тексты по-русски. Возможно такая книга и должна была быть двуязычной. "Россия-Пахан" -- ладно не переводится, но, кто знает, звучит ли хорошо по-английски. Пишу я "наугад". Не пишу то, что знаю. 4.20.04. For a few months I work on the textbooks only -- and I am tired of this kind of writing. This is "text" writing, not books. Flat, functional, primitive. I write about theatre, acting, film -- how could it be? What's wrong? Why can't it be "literature" too? Perhaps, I do not know how to write. Maybe I simply do not know the cycles of this online writing... So, often I have the thought that I do not know what I am doing. 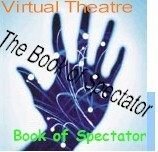 Writing Projects Pages @ GeoAlaska (Virtual Theatre) are to introduce the sub-directory with nonfiction books. The instructional (classes) sub-directories are self-explanatory (in textbooks). "GeoAlaska" (Virtual Theatre) is about to become bilingual -- I am writing in Russian again. Not only the Russian Play, but some pages in Father-Russia. Why not? Why not to use both languages? Am I used by now to online writing? Have I developed the new style? I write straight to my webpages -- and I do not print hard copy pages anymore. As if I am not interested in what I write? I do not have time to stop and take a close look at what I am doing. Like writing in airport or taxi. And I do it at home, behind the desk. Is that the web which make me run? 4.1.04. Two new writing projects: The Shrew and The Oedipus. For my next season directing. I didn't budget my time for those adaptations. And they will push out my other jobs; I have to have ready scripts by the end of the summer. And the "instructional" webpages: I keep writing the notes for my classes, and -- I do not have time to work on the textbooks, but jump at one subject or another. It's not the healthy competition of writing projects, but a chaotic chase, when I am not capable of focus on any of them. I feel that I back to the time, when I was editing small newspapers. OK, I can accept the situation, but can I find the logic and order in it? What a strange beast this new medium is! Что по-русски, а что по-английски -- не знаю. Может "русский" -- это временно, но кто знает?.. I don't have "personal" diaries, because my writing is personal. I stated it many times: I do not think of myself as a writer. I do not feel that I write. It's not a profession for me, but it requires craft and skill, like no other art. I do not make money by writing since I left Russia. Maybe this is a real blessing. Why? Because you have to be free from anything when you write. You might sell your book after you are done with it, not before. Какая разница? Да и зачем мне разбираться, почему опять по-русски? Раз пишу для себя, почему мне не читать по-русски? Какая разница на каком языке писать то, что никто кроме меня, читать не будет? Конечно, к положению "непечатаемого" привыкнуть так и не могу, приняли меня в Союз Писателей чуть не в двадцать пять. Почему не печатается? Плохо пишет, значит. Ни одной книги! Какой позор! Оправдываться не хочется. Извиняться? Большинство, они никаких книг не пишут и ничего не печатают... Нет, обьясняться не надо. Кто-то сказал: пока пишу, не так страшно жить. Верно. Хотя странно. Почему? * Keep removing htmlgears from the pages! По-английски "тексты", а по-русски хочется "прозы" -- двойной стандарт? На английском не было претензии на "литературу"? От того и писал по-английски? На вопросы свои я не отвечаю, по записываю, чтобы видеть, помнить и думать. По-русски у меня страниц об интернете нет, и не хочу начинать, хотя теперь как webmaster ("хозяин сети") я должен был бы подумать, как эти "сетки-страницы" будут жить на другом языке. Что такое -- по-русски у них другое существование?